Become FREE Again - And Regain Control Of Your MIND! GET RID OF ALL YOUR UNWANTED THOUGHTS - TODAY! They're enough to crush your daily life - and make you feel completely out of control. When you can't control your own thoughts, you feel insane. Crazy thoughts. Shameful thoughts. Obsessive thoughts. Thoughts that appear from nowhere. You may think "bad" or "extreme" things that you really don't want to think. Or you may obsesses about the future. Or washing your hands. You might perform little rituals at certain points, until you feel just "right". You might check, check, and re-check things. You might worry about losing things. You might fear that you're going insane... literally "losing" your mind. Whatever it is, you FEEL DESPERATE because you can't control your own thoughts. Does THIS sound like you? If so - you REALLY need to read on. Here's How Unwanted Thoughts Seriously HOLD You Back! Discover My Own Personal BATTLE with Obsessive Thoughts - And How I Discovered the SECRET to Becoming Free Again! And How I Discovered the SECRET to Becoming Free Again! My name is Bradley Thompson. I'm a best-selling author of over a dozen books, all focused on the human mind and it's potential. I've spent the past 25 years discovering how fantastic the brain can be. And I also know how PAINFUL it can be - when you're dealing with unwanted thoughts. How? Because I used to suffer from deep, painful, surging thoughts that would appear from absolutely nowhere. Thoughts that made me feel ashamed, and sad, and literally insane. The kind of thoughts that you daren't share with anybody. I would also obsess about certain symbols. And I had to keep doing little rituals with my hands until I felt "clean" and "whole" again. It was a daily battle. I knew it was irrational. But I still did it. Knowing that it was irrational made it even worse. It made me feel even more insane, and my self-esteem plummeted. Other people simply DIDN'T understand. And how could I possibly explain it to them? That's when I got involved in psychology. I spent years researching unwanted thoughts and how they came about. It was difficult: back then, very few psychologists truly understood why these things happened. A solution that allows you to take back control of your mind - and begin thinking in the precise way that YOU want to! Here's What Psychologists Discovered Back in the 1980s - And How YOU Can Begin Using This HIDDEN Knowledge To Put An END to Your Unwanted Thoughts, TODAY! These days, there's a term for being unable to control your thoughts. It's what psychologists call the WHITE BEAR SYNDROME. The story has it that famed author Leo Tolstoy, a Russian from the 1800s, once asked his brother to stand in a corner - and NOT to think about white bears. His brother stood in the corner and tried. He suppressed the thoughts of a white bear. He tried to remove the image from his mind. He tried to think of something else. Anything else! But NOT white bears! He tried everything - and eventually, exhausted, he admitted defeat. He couldn't get rid of the thought. Fast forward to the late 1980s, and psychologist Daniel Wegner decided to perform many dozens of experiments on this white bear concept, the idea of "unwanted thoughts" and "thought suppression". He discovered that those participants that tried to suppress the thoughts, experienced them MORE VIVIDLY. By suppressing, the unwanted thought came back EVEN WORSE - and began to become EVEN MORE uncontrollable. After some ten years, he made a BREAKTHROUGH. He began to discover that it was the perception of those thoughts that caused the problem. Not only that, he discovered there was a way to change that perception - and have the thoughts simply DROP AWAY, as simply as you'd drop a pen on the floor! He discovered precisely how you can control your mind - and regain control of these previously chaotic thoughts. Later research by psychologists and mental health professionals, including myself, resulted in even greater breakthroughs and advanced methodologies. I'm talking about techniques that YOU can use. At home. On your own. Suddenly, controlling your own thoughts became POSSIBLE. But in order to succeed, you needed to follow a very specific plan of action. Today, I'd like to share that plan with you. Are YOU Ready to Take Back CONTROL of Your Mind? Here's How to "Delete Thoughts" Like Files on a Computer - All Explained Within My Exclusive, GUARANTEED Guide! - All Explained Within My Exclusive, GUARANTEED Guide! Would YOU like to regain control of your thoughts? Would YOU like to delete unwanted thoughts from your mind - just as you'd delete unwanted files from your computer? Over 3% of the population currently suffer from White Bear Syndrome, and the vast majority are never diagnosed out of shame. Fast forward twenty years. Would YOU still like to be struggling the way you are today? If not, then I'd like to share something with you. It's my brand new, easily-accessible guide to stopping unwanted thoughts - based on all the very latest psychological research. A guide for individuals like YOU. Not a guide for psychologists. But for REAL PEOPLE. It's based on decades of research, 25 years of industry experience, and thousands of case studies. It was originally powered by my OWN personal experiences dealing with unwanted thoughts. And it's the ONLY book of it's kind available today. Recent research into thought suppression means that you can now control your OWN thoughts, from the comfort of your OWN home. There's no need to feel shameful about seeking a psychologist. There's no need to feel desperate, or embarrassed, or insane. Just follow a simple, step-by-step plan - along with a few simple exercises - and you'll NEVER experience unwanted thoughts again. Here's EXACTLY What You'll Find Inside The FULL Guide! Learn PRECISELY Why You're Having Unwanted Thoughts - And the FOUR Simple Techniques for Getting Rid of Them! I really, REALLY want you to discover how it feels to be without obsessive thoughts. You simply won't be able to BELIEVE the freedom. 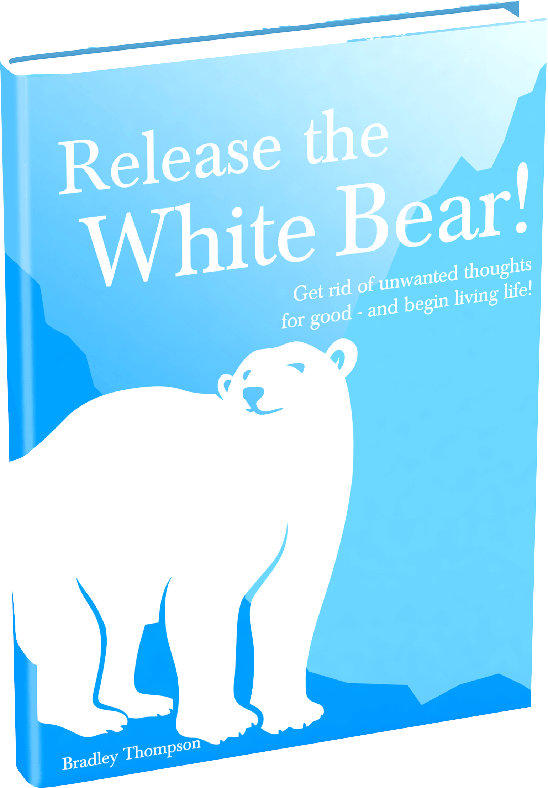 And inside my 40-page guide - "Release the White Bear" - I've compiled absolutely EVERYTHING you need to know to get rid of unwanted thoughts TODAY. You'll NEVER experience that strangling, panicking sense of turning insane. You'll NEVER need to perform that needless ritual until you feel "just right". No more shameful, bad, extreme thoughts. No more obsessing about the future. No more triple checking everything before you leave the house. Discover the PRECISE Reasons WHY You Have Unwanted Thoughts - I'll show you how they first appeared, and what you can do about them in future! How the COMPLEX MIND Model Works, And What It Means - Let me show you exactly what happens inside your brain, and where it's going "wrong!" Why Giving Your Unwanted Thoughts MORE ATTENTION Could Actually Help - It seems crazy, but follow my technique and see the difference! The FOUR SECRET TECHNIQUES for CRUSHING Unwanted Thoughts - Discover the ultimate four methods for STOPPING white bear thoughts, once and for all! So, would YOU like to crush those unwanted thoughts and enjoy the ultimate freedom - ONCE and for ALL? Get Ready to BANISH Unwanted Thoughts, FOREVER! I Would've Given Anything to Experience Freedom Again - Now YOU Can Enjoy It, At a Discount September Price! Are YOU ready to crush your unwanted thoughts? I'd like to send you my 40-page guide - "Release the White Bear" - TODAY. Remember, this is the ONLY guide of it's kind available. Not only that, I'd like to give you 24/7 access to our support team, so that you can receive around-the-clock assistance whenever you need it. How much will something like this cost? When I went through my intense period of experiencing unwanted thoughts, a couple of decades ago, I would've given anything to get rid of them. Literally. Everything I had in the world, just to feel FREE again. You might feel something similar. But I want you to experience true freedom - without the expense. SEPTEMBER OFFER: Reduced to JUST $37! For the first time ever, we're lowered our sales price to just $37 for the entire package. 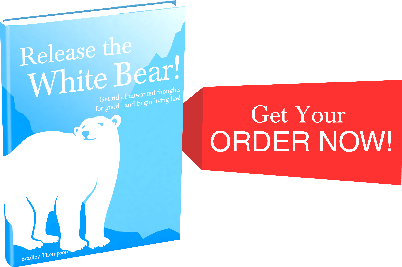 'Release the White Bear' is distributed in PDF EXE format, for Windows or Mac computers. Discover My 100% No-Questions-Asked GUARANTEE! If You Aren't Thrilled, I'll Refund Every Penny You Paid! I absolutely 100% GUARANTEE that you'll be FREE of unwanted thoughts - after you've read my guide! I've poured years of knowledge, research and personal experience into creating this guide. It's the first easily accessible guide of its type - intended for real people, and not elitist reading for the psychological community. I'm so CONVINCED that you'll be THRILLED with this guide - and that it'll help you crush ALL of your unwanted thoughts - that I'm putting my money where my mouth is. Try out the ENTIRE GUIDE for THREE WHOLE MONTHS - and just see the difference! If you aren't absolutely overwhelmed by the way this guide turns your life around, just let me know after three months (and before four months is up) - and I'll personally refund every penny you paid. Not only that, but this guarantee is backed by my publishers - the Self Development Network - so you can be assured that your money is safe. PLUS - SPECIAL FRIDAY BONUS! In addition, if you purchase the entire "Release the White Bear" package TODAY, I'll also send you two FREE EXCITING BONUSES. You'll receive two of my most popular audio courses, worth over $79 each, at NO COST! I'll be sending you "How to Command & Master Your Emotions" - my ultimate three-hour audio course to taking control of your thoughts and feelings, and being happy no matter what happens in your daily life. I'd also like to give you "How to Live a Longer & Happier Life," my second three-hour audio course on making the most out of life, by learning to live in the now and becoming happier with the world around you. That's over $150 in BONUSES, and six-hours of audio - and you can even KEEP the two audio bonuses if you decide to return the course for whatever reason. Here's EXACTLY What You'll Get When Ordering TODAY! The FULL "White Bear"
Guide, 24/7 Access to Our Team, My TWO Bonus Courses, PLUS a 3 Month GUARANTEE! This could be your LAST CHANCE to truly enjoy freedom of mind. There's NEVER been a better time to purchase this entire package - and you simply can't put a price on being able to get rid of your unwanted thoughts. So, here's a quick reminder of what you'll receive when you purchase TODAY! I'll send you my ultimate 40-page, NO-NONSENSE guide to getting rid of unwanted thoughts, once and for all. It's based on the latest in scientific and psychological research, covering the four most powerful methods for crushing unwanted thoughts INSTANTLY and PERMANENTLY! You'll never experience unwanted thoughts again. Includes the fourth, most powerful "releasing" technique. Got questions? Need assistance with any part of the program? Don't worry! Our team are on-hand to help you through any issues you might experience. That's what we're here for! Discover my three-hour audio program for taking control of your thoughts and feelings. Don't feel overwhelmed by the world around you. Let me share my techniques with you! Sit back and relax with my three-hour audio course on making the most out of your life! Learn to love everything you have in your life today - and keep discovering how to live more in the now. Try out the entire course for three whole months! It'll absolutely CHANGE your life, and crush any unwanted thoughts you may have. If you aren't entirely thrilled in any way whatsoever, I'll personally refund every penny you paid! - All for the lowest ever price of JUST $37. Are you ready to let go of your unwanted thoughts? Unwanted thoughts make life a living NIGHTMARE. You can't control your own mind. You do things over and over until it feels "right" in your mind. You experience bad, extreme thoughts that you can't get rid of. You obsess about little things: like washing your hands, or stepping on cracks, or turning off appliances, or certain "unlucky" numbers. You might even worry about losing your mind. You need to begin controlling your thoughts. NOW. You cannot still be suffering with this in twenty years time. There's only ONE sure-fire way to begin taking control of your mind again. And that's by tapping into the very latest in scientific and psychological research - from a man that's been there. "Release the White Bear" is the ONLY guide that can share this information with you. I'll show you precisely how to get rid of unwanted thoughts for good, so that you'll never have to worry or even THINK about unwanted thoughts ever again. It's EASY - and I'll show you how. I'll give you the top four methods, alongside the most powerful "Releasing" technique that I know will blow your socks off. So, take control - and make the decision to click on this button to order your copy, NOW! You'll never, ever regret making this decision. I promise that you'll be experiencing the ultimate in freedom - in just days from now. You'll be a changed person and won't be able to believe the shift! There's a reason you ended up at this website. I invite you to click the above button, take control once again - and discover that reason for yourself. PS. This guide is NOT available in stores! You won't find at Amazon, eBay, or anywhere else online or offline. It's exclusive to StopUnwantedThoughts.com. And it's still the ONLY guide of it's type available anywhere. Want to take control of your thoughts - NOW? Click here to own your copy of "Release the White Bear." PPS. Remember, this is the BEST PRICE I've ever offered this package! Yes, I could be charging thousands for this information. I could be trying to squeeze every last penny out of the 3% of people that suffer with this condition. But I believe in karma - what you give out, comes back to you. That's why I want you to click here and begin controlling YOUR thoughts, TODAY! PPPS. Don't forget: If you're not 100% thrilled, I'll refund every penny you paid! That's how much I believe that this guide will really help you cast aside all of your unwanted thoughts. The feeling of freedom you'll be experiencing just days from now is awesome. I know, I've been there. Now it's your turn. Click HERE to grab your copy of "Release the White Bear"!